The Residence is situated in a quiet and peaceful area in Valledoria, at a stone's throw from the beach and all services (supermarkets, news-stand's, bars, tobacconists, etc.) If you wish to visit the nearby locations, we advise to use the car. All units are quite large and finely furnished, granting a relaxing and comfortable stay. The accommodation is strategically situated nearby the beaches but in a tranquil zone at the same time, without busy roads and only with the local residents passing by. Parking is located directly in front of the complex. The ground floor apartments feature a veranda in the front, while the first floor units boast a large terrace where it is possible to eat. Services: free parking spots in front of the property or in the nearby street. Pets are allowed at an additional cost. All main services can be found within 300 metres (bars, restaurants, pizzerias, ATM, souvenir shops, markets, pharmacy, etc). 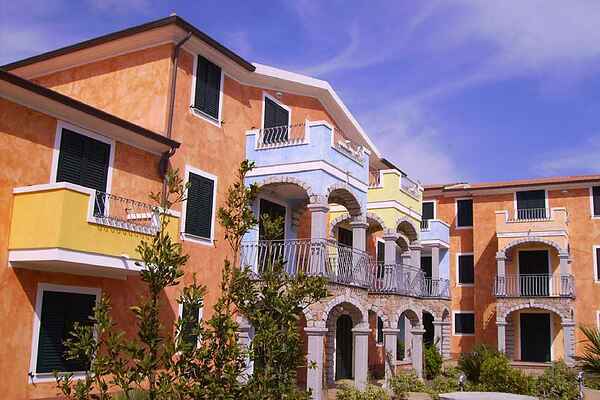 San Pietro a Mare is a large, sandy beach at 1800m from the property. You can reach it with a pleasant walk or bike, as totally flat, as well as by car or public transportation. All services are within 300 meters (bars, restaurants, pizzerias, ATMs, souvenirs, supermarket, pharmacy, etc ...). The first beach (San Pietro a wide and totally sandy beach), is 1800 meters easily reachable on foot or by bicycle being a totally flat area, as an alternative with the municipal transport or by car. For who wants to visit this beautiful island, there are lots of places like Alghero, Sassari and Porto Torres to begin with. Then if you want to take the boat, a real eyecatcher is the Maddalena island!